A brand which has always promoted itself among the selfie lovers is gearing up for its next big launch. And just before its official release, the specifications are surfacing on the internet. Yes, Oppo F3 Plus specifications are leaked and at the front, it features two cameras just like the Oppo F3. Both these phones will be oriented towards providing a better selfie experience to the user. The design is quite similar to its predecessor but, with a difference in the screen size. Another major difference is the introduction of Qualcomm MSM8976 Pro Snapdragon 653 processor which was introduced last October. The upcoming smartphone from Oppo will feature a 6.0 inch full HD display which is protected by Corning Gorilla Glass 5. Powering the phone is a Qualcomm MSM8976 Pro Octa-core processor which is coupled to 4GB RAM and 64GB of internal storage. The internal storage can be further expanded up to 256GB via microSD. The Oppo F3 Plus comes with a 16 MP rear camera and dual camera setup at the front which includes a 16-megapixel and 8-megapixel sensor. However, LED flash seems to be missing which might be a drawback for a camera-centric smartphone. 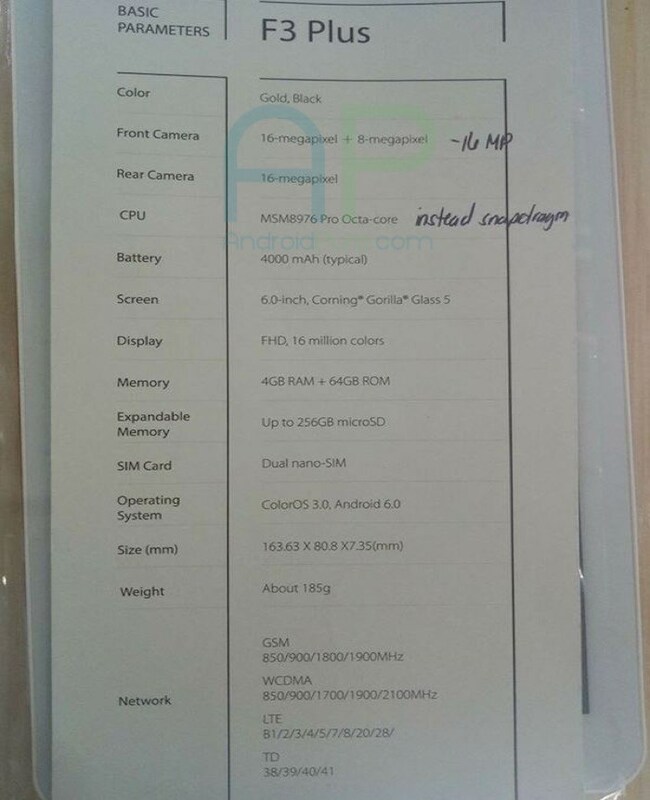 The phone will run on Android 6.0 (Marshmallow) and the overall dimensions measure 163.63 mm X 80.8 mm X 7.35 mm. The phone weighs 185 grams. The Oppo F3 Plus will be available in Gold and Black color options. According to different media sources, Oppo will release its F3 and F3 Plus on March 23 and the prices are expected to be revealed around the launch.